I do not really know whether the answer is there or not, but I have had plenty of time to listen to it (the wind, not the answer). I have set off at eight o’clock this morning, thinking how a few months back I was afraid of being slowly baked on the motorbike wearing the riding gear and how different it has turned out to be. The sky was overcast and it was even a bit chilly. Not enough to justify putting on the thermal lining on the jacket or even wearing anything else than a T-shirt underneath, but cool enough to require a scarf and having the hands a bit cold (I was wearing summer gloves). 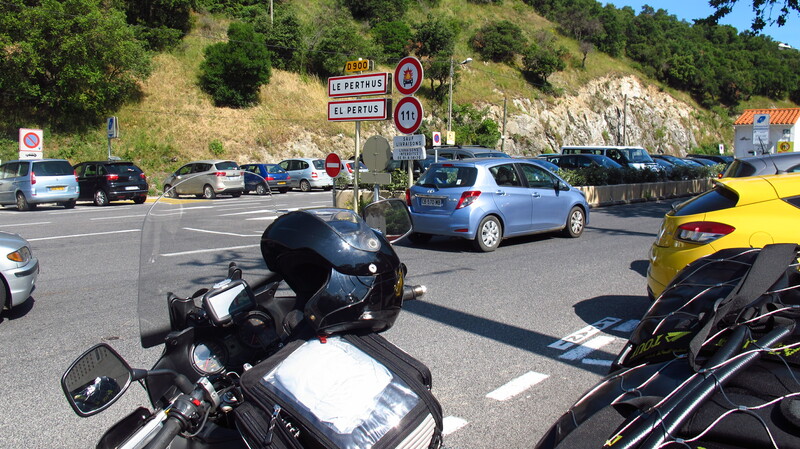 I had decided that if I was going to stick to my daily budget, I could not afford to pay tolls all the way to Grenoble, so I had planned to take A-roads and B-roads to Montpellier and then, depending on how much time I had left, get on the motorway for the last 300km to get to the campsite I had found before reception closed at 20:30. The motorway from Barcelona follows the coast, but I have not got near the sea until the border with France, and there is where the wind has started. I know the Mediterranean coast along the north of Catalonia and the south of France is usually very windy, so I was expecting this. What I was not expecting was the wind to still be there once I turned inland, and I was definitely not expecting it to be so strong. I have been told that it gets quite bad on the open spaces of Kazakhstan and Mongolia, so I guess that today has been good training. I thought the only problem today was going to be boredom and fatigue, as it is the longest day of all (720km), but the wind has made it so much harder. It blew constantly and from all directions, creating turbulences all over the screen and the helmet that have almost driven me crazy. I am still wondering how I have not ended up with a splitting headache. Not only that, it was strong and unpredictable enough to throw me off course, and more than once today I have been close to flying off the side of the road, being blown into the path of oncoming vehicles or being blown against the cars to my left on the motorway. But the wind, despite having spent the whole day trying to kill me, has not been the worst part. Pulling out onto the street from the car park and looking back to say goodbye one last time to Nat has been the hardest thing to do. I have taken some long(ish) trips on the bike, some of them for more than a few days, but there was always someone to go back to at the end. At that moment I have finally realized that I’m going to be riding away from home for a long time before turning back. I teach languages, and that means that I spend most of the day talking and listening to people. Very often, just as someone who spends the whole day in front of a computer at work does not want to check his inbox to see that hilarious video you have sent them, when I get home, the last thing I want to do is talk, so I thought that spending some time on my own would be great. Well, it is, and I like it, when I know that at the end of the day I will have someone to tell how great it has been, so today, by lunchtime, I have found myself looking forward to my first couchsurf tomorrow, much more than I thought! I do not mean this as a negative comment about travelling on my own, quite the opposite. I am glad to have realized I feel this way, as I am quite a shy person and I was a bit worried about that getting in the way of the experience, but I see now that I am going to be even more open to meeting new people and sharing the experience. This morning, about an hour after setting off, an elderly man has approached me as I was fuelling the bike in a small town near Olot and made a comment about how much stuff was on the bike. That has quickly turned into an enjoyable conversation about the trip, and the guy working at the petrol station has also joined in. In the afternoon, already well into France, I have stopped to buy some fruit and the same kind of conversation has taken place again with the couple who were selling their stuff by the road. This is a great way of travelling, so different from jumping on a plain and suddenly being in another place. I knew what the French villages on the Pyrenees look like, I knew how the coast of Brittany looked like, I also knew how Paris looked like, but I had no idea what the country really looked like. I had only seen a few parts of it. There is no way we can say ‘yeah, I know Germany, I’ve been in Berlin a few times’ for example. I had driven all across France six times, but even that was on the motorway, 12 hours, non-stop. Today I have seen a completely different country for the first time, and if a country I thought I knew has been such a nice experience, I wonder how the rest is going to be like. I am now typing this on a laptop lying in my tent, in Vizille, near Grenoble. I seem to have found a lovely campsite – in the forest, with great facilities, really cheap, quiet… that is missing the two things I needed the most today: beer and the internet. I have got here relatively early, so I have decided to set up camp, go for a shower, have dinner and then go to the reception bar for a beer and write this post while I drank it seeing the sun set behind the mountains. Wrong timing. This is not a Spanish campsite on the coast. The bar was closed. And a quick expedition into town has been equally fruitless, so I have decided to call it an early night and take the chance to write a good long post about the first day. 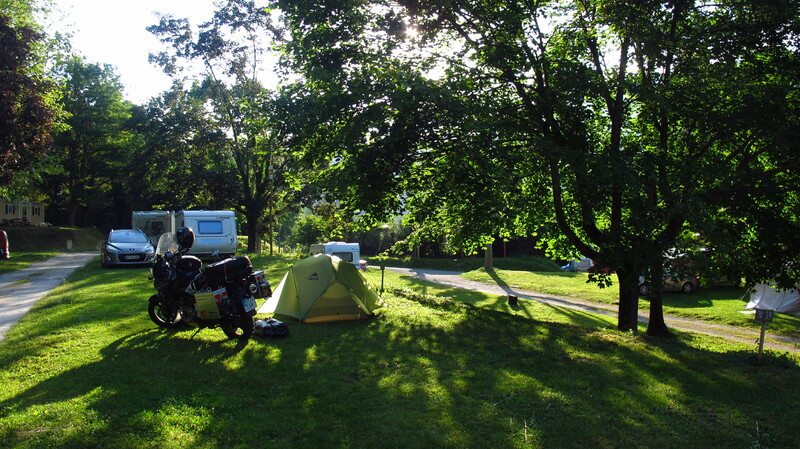 This entry was posted in Stroming The World 2013, Travel and tagged camping, campsite, Grenoble, Vizille, wind by Kilian. Bookmark the permalink.